Grief, depression, heartache and sadness. They roll around like dice, one landing firmly in place and the other balancing on edge making it nearly impossible to see what the exact emotion is you have to play with. It’s a heaviness, a pressure sitting on your chest when you’re trying to climb up and out of your hole. For some, it’s the holidays. For me, it hit after. I survived the two year anniversary of my husband Joe’s death, what would have been our five year anniversary was masked by travel and sunshine. I turned 33 and five days later our daughter’s 3rd birthday party. Then straight into the holidays where I like most mothers was the master of creating magic, signing Christmas cards and buzzing around like the jolly little elf I wanted to be. As I packed up the last of the tree skirts and vacuumed that last GD glitter sparkle out of the couch, something went with it. My light went out like the switch of the Christmas tree. I’ve felt a darkness I haven’t felt. The loneliness became crippling and there were days I’d catch myself daydreaming of not being here at all. Here’s where loving someone when they’re broken is the only way someone can survive all of this. Little did I know my mother and grandmother have followed a Facebook page “One Fit Widow” about the same time I had desperately started searching the interwebs for help and guidance on how to do this whole, “my life is falling apart and I lost my person” thing. They follow along and read the articles in hopes of knowing what to say and avoiding me from screaming or going crazy on them, though I can’t and haven’t made any promises. They sent me off to the west coast to attend a One Fit Life retreat in the mountains. I jokingly said they were sending me to fat camp but I got down my suitcase anyway. As I packed my bag and even shopped for a few new things for my trip, a sadness was constantly following me. Why can’t I just be excited? Why can’t I feel what I once felt? I’m heading to Vegas for God sake! Joe and I used to love traveling. We’d pack our suitcases and leave just enough time at the airport for a beer before we’d board. Then traveling was stolen from us, our trips became “cancer trips” and we’d travel back and forth from Florida to Texas to see doctors and seek treatment. Now, nothing feels fun. I lost my fire. That feeling you have when you’re on a boat and you look out into the water and the sun is shining just right and you have the feeling of “wow”. I can’t seem to find it as much as I try. Though the dark cloud seemed to slip into my carry on, i pushed through and headed out to Lake Las Vegas to start “fat camp”. 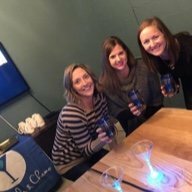 I roomed with two women I’d “met” online in our Cocktails & Chemo support groups. 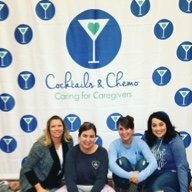 We started out together as young cancer wives, now turned young cancer widows. I sat with these basic strangers in a hotel room we poured our hearts out and recounted our final days with the men we loved. I felt safe as I let my regrets and saddest moments leave my lips and fall into a loving space. Cocktails & Chemo friends and roommates. As the weekend started we were asked by the leader to come up with our goals, what we wanted out of the weekend. I answered to myself, “to feel, anything”. 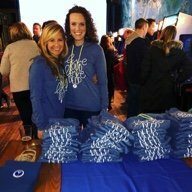 The founder of One Fit Widow, Michelle Steinke-Baumgard. The motto of the group is, “No excuses, no regrets”, so that was mine too. i hung with the group and tried everything. I whipped my big booty over a wall and climbed up a rope. I asked the young coach with the bulging muscles and flowing man bun to spot me over the tallest wall and let him spot me however he saw fit, I mean no excuses no regrets, right? That’s man bun in the background, clearly posing for a picture with us. I was playing the part of surviving Amanda that I’ve been playing for the last two years as we hummed along until we hit our final station. A massive tire stared at me from the floor. I listened to the instructions from a woman who I’m pretty sure eats these tires for breakfast as she explained the technique and told the group to start off with the lighter ones and work our way up. I watched as women tried and failed and laughed it off as I felt the fear inside me. My heart was racing as I approached the 300 lb tire and began to try to lift it. It was too heavy. My arms could hardly get under it and I was ready to give up when I heard my friend and roommate say to me, “You’ve got this Amanda, you are so strong.” I thought, I am. The weight of this tire is nothing like the weight I’ve been carrying around. I’ve had to endure things so much harder and I pushed and grunted and flipped that freaking tire right over. Maybe it was the shot of endorphins that comes with doing something physically challenging or the competitive side of me that was so happy to win, but I felt something piercing through the darkness that has swallowed up my shoulders. I’m slowly coming out of this darkness and I know it’s going to try to come creeping in but the fact that I felt something again has given me so much hope. I will never forget this weekend. I hope I will never forget this feeling. I am forever so thankful for my family who has loved me fiercely as I’ve been at my very worst. If my the lineage of women who raised me hadn’t taken action, I know I wouldn’t have done it for myself. The crazy thing is, I can feel Joe closer to me when I feel like this, like I know how very proud he is of me. The truth is, I’m pretty proud of myself. This is after a run that was supposed to be 3.5 miles but ended up being closer to 5. This is why directionally challenged people shouldn’t run. You should be proud of yourself! Way to go lady! I hope you keep the exercise ball rolling, it can enrich your life and make you feel better. Why? because we are STRONG we are BRAVE we are ENOUGH #rhinostrong! Oh wow!!! Good for you. I lost my husband of 14 years in Oct 2016 to colon cancer. We have 4 children 9-13. I feel nothing. I run the house our farm our farm business. I know nothing but continue through the motions. I took the kids on a hot holiday at Christmas. I know I went but I remember nothing of Christmas or the vacation. Just feeling the heat. I remember thinking I’m not numb I feel the heat!! A wonderful read. I was also there at Camp Rhino with many new friends I made on my first Adventure Weekend. 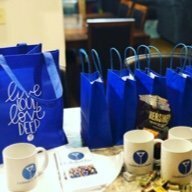 Thank you for sharing your story and your 1fitwidow/1fitlife adventure. Your followers will also enjoy reading as much as I did.. May you continue to find new strength you didn’t know you had. I hope to meet you in person some day at another Adventure Weekend. So proud of you Amanda! You are pushing through, just like those women in your family pushed through with their lives. Your challenge is a big one, but you can do it……and I know you will.